Pictorial maps often allow a certain degree of artistic license and can be extremely effective instruments of propaganda. 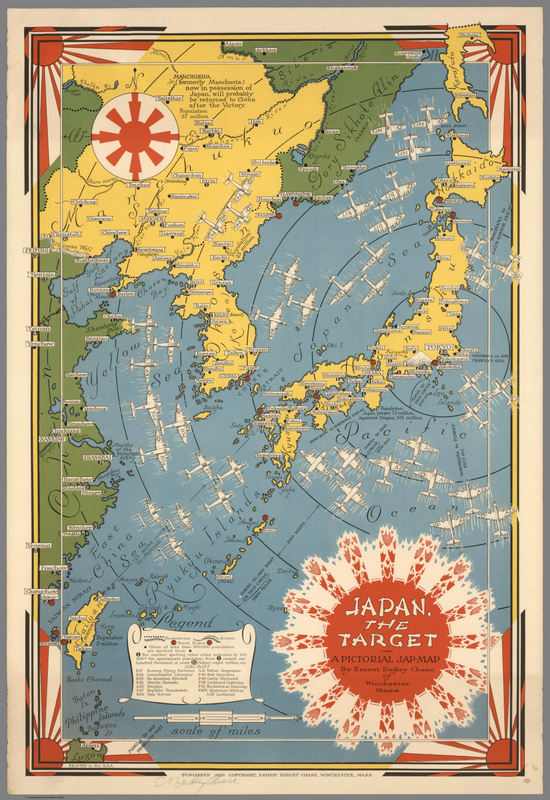 This wonderful map from World War II by Ernest Chase uses colour and symbology effectively to create a graphically simple yet powerful image of Japan as a ‘target’. The colours clearly demarcate the enemy and the use of stylized Japanese rising sun symbology supports the notion of a threat posed. Different aircraft types give a sense of superiority in the air and their flight paths diverge upon Japan provide an impression of wholescale attack and the enemy having little chance of either retaliation or defence. The aircraft are even drawn with the effect of movement and convergence to emphasise their rapid attack. Perhaps it’s the concentric circles drawn across the map that identify distances to various cities and between cities such as San Francisco and Manila that provide a sense of accuracy and precision as if the map could actually support military purposes. Some general topographic detail is included as well as the location of naval bases. The hierarchy is well established and the map bleeds well into elements of the border. Overall a beautiful map and an example of the pictoorial style used to create a busy and evocative impression in the map readers mind. This entry was posted in MapCarte and tagged illustrative, MapCarte, pictorial by @kennethfield. Bookmark the permalink.